We hope that you have all enjoyed this magnificent summer weather here in Switzerland. Your ExCom team is feeling full of renewed energy and enthusiasm for working towards our goals. Our Zurich Chapter included - see report from their Chair, below. Remember that the more we grow the stronger our voice is in Washington. Get involved by participating in our activities, making suggestions and letting others know about us. Even simply "share" and "like" the Democrats Abroad Switzerland Facebook page is a helpful way to make us known. Help us to build our democratic community! Please scroll down to find upcoming events in and around Switzerland, how to donate items now to the November on-line global auction fundraiser, special-election GOTV campaigns and a list of our growing committees and task forces. Kongresshaus – Gartensaal, Claridenstrasse 3, 8022 Zurich. Freee admission. Over 110 exhibitors of goods and services geared to the English-speaking community In Zurich and beyond. Visit the DA table. Welcome drinks and starting point: 5 rue de la Muse, 1205 Geneva. Guided tour: Adult 70CHF, student/AVS 35CHF. With dinner: Adult 120CHF, student/AVS 85CHF. To sign up, please click here. The DACH Art Walk is a guided tour of contemporary art in the Geneva's Quartier des bains and a fundraiser for DACH get-out-the-vote activities. All Americans and their guests are welcome! Saturday, 14 September, 3pm – 6pm: Slugout in the Dugout – Revenge match! Marines' field, Bellevue (Geneva). Admission Free. Details provided though mandatory registration at http://bit.ly/19j06Y3, entrance with photo ID. The 4th Annual Democrats Abroad vs Republicans Abroad softball game that took place in June was lots of fun! However, it was a rainy day and many stayed away, (and the Republicans won), so we have all decided that we needed a revenge match! If you are interested in playing, please let us know! Everyone is welcome to join the team, come out and watch, enjoy the food, drinks, and (hopefully) excellent weather. Whether player or spectator, you must sign up, however, in advance to get on the list. This is the organizing conference for the DAG Women's Caucus. The caucus aims to create a forum to engage women and men in dialogue about women's issues, to build awareness for what a women's caucus can do, and to prepare for the 2014 mid-term elections. Any DA member in Germany or neighboring countries is welcome to attend. Get full description from vice-chair@democrats.ch, and you can register here. Ramada Encore Event Center at La Praille. Free admission. Over 130 exhibitors of goods and services geared to the English-speaking community In Geneva and beyond. Visit the DA table! (Place TBA). Please see Zurich chapter report, below. All members in greater Zurich region encouraged to attend, learn about the chapter and elect your leadership. 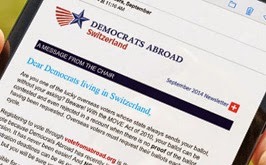 This is the major 2013 fundraising event for Democrats Abroad International and Switzerland. Enables our critical Get-Out-the-Vote activities. Now collecting donations for auction! US citizens with a product, service, vacation property, or any other item that might be of interest to bidders worldwide, please donate today! See examples and learn all about it at www.BiddingForGood.com/DemocratsAbroad. Over the past few months, Ashley and I have been building the presence of DA here in Switzerland and in the States. During a recent trip to New Orleans I made great contact with hosts of many popular shows on MSNBC. I will be working with them during the 2014 election season and look forward to seeing how this partnership turns out. Announcing: The 2013 elections for DA Zurich Chair and Secretary /Treasurer positions. We are scheduling the annual Zurich Chapter meeting and election for Saturday October 12th, time and place to be announced. More details will follow soon. Events: Come to the Zurich Expat Expo, this Sunday! (See Events Calendar above, and Volunteers below.) On-going, if anyone has an idea for a get-together or event they would like to schedule, please ask! We will do our best to help organize and attend such events. We hope to see many of you at the Expat Expo and our October meeting, and have a chance to meet our numerous new members. Renee Rousseau, Zurich Chapter Chair, zurich@democrats.ch, and Ashley Wheeler, Zurich Chapter Secretary / Treasurer. VOLUNTEERS - Emily T. Blitz volunteer@democrats.ch. Write today! Helpers needed for three events: 1 September Expat Expo Zurich and 6 October Expat Expo Geneva. The more the merrier, come join us for a morning or afternoon shift! And TBA starting end of September, Student Outreach Events will be organized across Switzerland. We are looking for any members, especially students and young Dems, who'd like to help organize and host these events. For those who prefer to work from home, help us Get Out The Vote in September by phoning NJ voters in Switzerland (see below). Full help and script provided. Interested in joining? We welcome you! Currently, we seek: New members for the Events and Fundraising Committee, and Social Media whizzes. Membership and Voter Outreach Committee (MAVO) Chair, Sarah Wiebenson sarah_wiebenson@yahoo.com, Bob Samors – GOTV Outreach, Amber Davis - Stuudent Outreach, Katherine Hagen - International Organization Outreach, Charles Landow - Young Professionals Outreach.